We recommend getting your pets spayed and neutered by 6 months of age. We can do surgery on animals as young as 8 weeks of age. Your pet must weight at least 2.5 pounds, and if male, both testicles must have descended. If your pet has any additional concerns, such as in-heat, pregnant, dental needs, etc. Please remember we have a high call volume and will try to return your call within a timely manner. The cost of surgery already includes a cone or e-collar for dogs only, which helps prevent your pet from licking and irritating the surgery incision. If you would like to purchase pain medication for your pet, it is an additional fee. Pets must be current on age appropriate vaccines. If your pet is due for vaccines, they can be done at the same time as the surgery or you can bring them in before-hand to our walk-in vaccine clinic. Please see our "Vaccine Clinic" tab for more information about this. If your pet has had vaccines done at another facility, you must bring the proof of vaccines with you to the appointment. 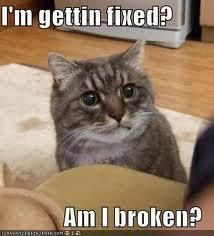 You must call to schedule an appointment for spay/neuter surgery. We do not currently offer the option to schedule surgery appointments online. Our normal surgery days are only Monday through Friday, but vary week to week depending on Holidays and the doctor's availability. Drop off is between 8:30 am-10:00 am and pick up is the same day between 5:30 pm-6:00 pm. Your female pet will live a longer, healthier life. Spaying helps prevent uterine infections and breast tumors, which are malignant or cancerous in about 50 percent of dogs and 90 percent of cats. Your male dog will be less likely to roam away from home. An intact male will do just about anything to find a mate, including finding creative ways escape from the house. Once he's free to roam, he risks injury in traffic and fights with other male animals. Your neutered male may be better behaved. Un-neutered dogs and cats are more likely to mark their territory by spraying strong-smelling urine all over the house. Your dog might be less likely to mount other dogs, people and inanimate objects after he’s neutered. Some aggression problems may be avoided by early neutering. Try your best to limit your pet's activity level for the next 10-14 days and the cone collar should be kept on AT ALL TIMES. Your pet should be able to eat, drink, and sleep with the cone on. Please note you will need to elevate their food and water bowls to help them access them with the cone on. Pets should be restricted to short potty walks, we recommend to keep them in a kennel or confined to a bedroom when you are not monitoring them, pets that like to play/rough house with other pet's should be kept separate until they are completely healed from surgery. Cats should be kept indoors, if they are allowed outside. For females, surgical steel sutures are usually used and are permanent under the skin. Staples and or surgical glue may also be used to close the skin. If your pet has staples, they should be removed in 14 days after the surgery. You can drop-in anytime we are open and have these removed for free. The night of surgery when you bring your pet home, they may still be a little groggy from the anesthesia. Please keep them in a dimly-lit and quiet area until they are more alert. After surgery, cats may not want to be handled right away, allow them to come to you when they are ready. You may feed your pet at their normal dinner time after the surgery, however we recommend feeding them half of what they normally eat so as not to upset their stomachs. It is normal if your pet does not want to eat or vomits it's food the night of surgery. If your pet's appetite is not back to normal within 24 hours, please call us ASAP. Healthy animals do not need antibiotics following a routine sterile surgery such as spay/neuter. Most post-op incision issues are due to self trauma (licking) by the patient and DO NOT require an emergency room visit, unless there is tissue/organs hanging outside of the body wall. If you go to another vet, YOU will be responsible for the bill. Well Pet is not liable for any complications that may arise. 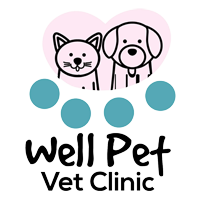 Please drop-in to Well Pet any time during normal business hours to have your pet's incision checked for free if you have any concerns. Microchips are small computer chips that are the size of a grain of rice that is inserted under your pet's skin, usually between the shoulder blades. Microchips carry a unique ID number to identify your pet. Microchips are not tracking devises. When a microchip scanner is passed over the over the pet, the microchip transmits the microchips ID number. We recommend that all pets receive a microchip to help ensure that your pet is returned to you in case they are ever lost or stolen. Although, putting a collar with an ID tag and contact information on your pet is also important, microchipping is permanent. You do not have to worry about it ever falling out and it will last the lifetime of your pet. It is important that you keep your contact information up to date so that you can be reached in case your pet is ever lost. If your pet has already received a microchip elsewhere, please let us know so that we can put the microchip number into our computer system and your pet can have a completed profile.